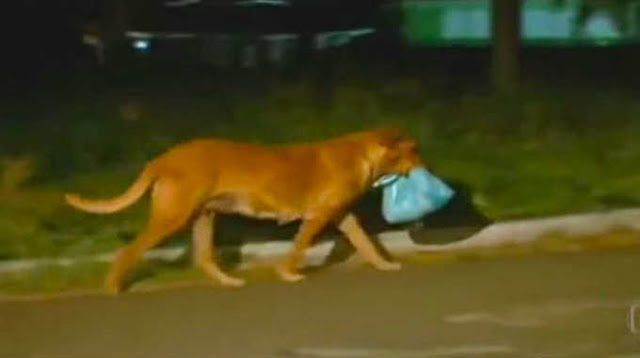 THIS HEROIC DOG WALKS 4 MILES EVERY NIGHT TO FEED HER HUNGRY FAMILY! THIS IS INCREDIBLE! A once homeless dog turned into a superhero for a poor community in Brazil. Lilica was abandoned outside of a junkyard in the city of San Carlos, where she was taken in and quickly became a favorite of the junkyard’s owner and of the children who live there. The villagers say this street mutt has a kind soul and that you can see in her eyes how different she is from the others. When Lilica became pregnant with 8 puppies, it was a joyous time for everyone — but it also meant a lot more mouths to feed. What Lilica did next blew everyone away. In the darkness of night, Lilica began hitting the road in search of food for her animal family. The dog walked 4 miles to bring food home for not only her own pups, but other animals in the junkyard! Watch how the entire community comes together, with Lilica smack dab in the heart of the goodness. This is almost too amazing to believe. Please SHARE this video! This post was republished from blog.petflow.com. You can find the original post here.